Last summer the Express-News made a big fuss over a reader survey for its comics section in advance of making a few minor changes to its comics lineup. So I was a little startled last week to open up the paper and find that they had suddenly dropped five comic strips and added three. With one major exception, I don’t have a problem with any of the changes. I’m just surprised that they did it without any forewarning considering their past cautiousness when monkeying with the sacred funny pages. The latest comics shakeup was brought about by the decision of T.K. Ryan to retire his long-running Tumbleweeds strip. While not one of my favorites, Tumbleweeds was still a good strip that I would read on occasion and I respect Ryan’s decision to end the strip and not pass it off to the syndicate. The E-N took advantage of the Tumbleweeds exit to dump Willy n’ Ethel, The Amazing Spider Man, and Snuffy Smith. I was mostly indifferent to Willy ‘n Ethel. I thought Spider Man was stupid and Snuffy Smith, one of the longest running strips, should have been retired decades ago. But the BIG problem I have was the decision to drop the daily Curtis strip (it will still run on Sundays). Curtis is an excellent, contemporary strip that has fresh and intelligent story lines (not a gag-a-day strip) and great character development. Why would they dump Curtis and keep Prickly City and Cathy, both of which scored in the Bottom 10 of the last comics survey? Better yet, dump Born Loser, Marvin or The Lockhorns to free up space. The new strips they chose to add - Retro Geek, The Other Coast and Family Tree (Sunday only) - seem like fine choices, but why would they pass on Sherman’s Lagoon which was one of the top requested strips in the last survey? And some other excellent strips that are missing from the E-N include Monty, Big Nate, Rudy Park and Heart of the City. Like most people who pay attention to polls, I was fully expecting Barack Obama to breeze to an easy victory in New Hampshire the other day. In fact, the last person who figured that Hillary Clinton would win in New Hampshire apparently was Hillary herself who seems to have been almost caught off guard by the surprise victory. I’m not sure what happened exactly, although Kevin Drum is probably correct that it was just the cumulation of a lot of little things going on in the midst of a fluid situation. You can blame the polls that had Obama 13 points up, but just realize that all the polls seemed to agree on this and they also got the Republican race exactly right. So Hillary clearly “won” even though based on the all-important delegate count it was a tie. I was already prepping myself for an eventual Obama victory which could still happen although things are much more cloudy than before. I think what New Hampshire does show, however, is that Obama might be the better candidate for the general election based on his appeal to independent voters. Also, he would be less of a rallying point for the wingnuts’ whose hatred of Hillary is beyond demented. Nevertheless, I think Hillary or Obama either one would be a good candidate and would win in November. On the Republican side, I think John McCain has swapped places with Rudy Giuliani as the new consensus candidate of the GOP establishment. This still rubs the wingnut faction the wrong way because even though he is more socially conservative than Rudy, he falls short on their immigration litmus test. In addition, McCain supports campaign finance reform, opposes torture and (the real kicker) actually wants to do something to combat global warming! However, McCain still proudly wears the Iraq albatross around his neck and that by itself would sink his candidacy as it will any GOP nominee. I drove to Dallas and back yesterday for my Uncle Kenneth’s funeral. He was 73 and had survived several previous bouts with cancer before finally succumbing this time. I don’t get to see that side of the family very often and it was nice to catch up with my cousins and see their families. But now I am back and I am still exhausted from the trip. On the drive up I subjected myself to a little Hate Radio (Glenn Beck) until I was ready to bash the console in and finally gave up and put in a CD. It is infuriating that these people (Beck, Limbaugh, Hannity, Savage, etc.) get hours of airtime everyday to spew their crap with absolutely no opportunity for anyone to counter, debate or correct what they say. It is no wonder that so many people today vote the way they do when their minds are filled with this garbage that constantly spews forth from their radios and TV sets (Fox Noise). That is the only explanation I can come up with for a rather disturbing Op-Ed entitled “A Few Opinions for the Candidates” that ran in the Express-News last week (Jan. 5 and not online). I want anyone who cannot show a government-issued identification sent home immediately. I am tired of weary people crawling upon my shores, dropping a baby and expecting the whole family to immediately become U.S. citizens, entitled to all manner of government assistance. I suggest a steady stream of buses lined up for the sole purpose of sending them home. Once. Ha Ha! Imagine everyone having to have a government identification tatooed to their foreheads so they don’t forget and leave it home someday and end up being deported to Panama during a trip to the grocery store. Ha Ha Ha. But wait! She’s not kidding, is she? She’s serious. And the Express-News is printing this crap?!?! I’m sure that politicos get these kind of letters everyday and most end up in the roundfile (unless you are Lamar Smith in which case they are framed and hung on the wall). Just like everyone else, I can think of just as many good reasons to stay in Iraq as I can to get out. Just like everyone else!?!? Clearly this deranged woman is like the woman in the Opus cartoon who “gets all of her news from Bill O’Reilly” if she thinks that this is how everyone else thinks. Vast majorities of Americans have been demanding that we get out for years now. Only the tiny faction that still supports George W. Bush thinks we should stay in Iraq. We need to be there to watch them develop and to see that the same old evil does not crop up in a brand new dictator. And just how does she think Saddam Hussein accumulated so much power in the first place? Remember the famous picture of a younger Donald Rumsfeld gladhanding Hussein back when he was Reagan and Bush the Elder’s favorite Middle Eastern dictator who we were funding to serve as a counter to the Ayatollah in Iran? We didn’t prevent the rise of Hussein, rather we facilitated it! I’m sick to death of all the special interest groups my taxes help fund. Build roads, build schools, protect my nation and give me back the change. Roads, schools and military. That’s all she’s is willing to fund. Hmmmm. Well, at least that makes her somewhat more progressive that a lot of wingnuts I know who would not include the first two items on her list. And this woman has a master’s degree in education. Pretty scary. Hey! Here is something that Bill Crawford and I are in complete agreement on! I think Roger Clemens has been getting screwed around by this Mitchell Report which named names based on lots of hearsay evidence that probably would not stand up in court. I personally believe Roger’s denials about taking steroids and after listening to the tape of the phone call with his chief accuser, I think it is even more clear. Clemens is owed an apology and MLB needs to drop this witch hunt and concentrate on improving its flawed drug policies. 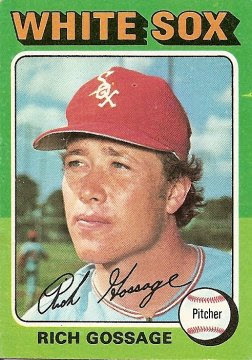 Congratulations to Goose Gossage for his election to the Baseball Hall of Fame. Goose just missed election last year and benefitted this year from having no obvious shoo-in candidates added to the ballot. Unfortunately, Jim Rice missed election by a handful of votes this time along with Andre Dawson and Bert Blyleven, all of whom I think should be in the HoF. Maybe we should lower the threshhold for entry to 60 percent of the vote rather than 75 percent - in that case, all of the above players would have made it in. Either that or get a less pig-headed group of sports writers to cast ballots. This was the last chance for Dave Concepcion and now it will be up to Veterans Committee whether he will ever get in. And my favorite, Chuck Knoblauch, did not recieve enough votes to remain on the ballot next year. I’m not surprised. Next year, Ricky Henderson should be a shoo-in for election and hopefully Rice, Dawson or Blyleven may be able to squeak in at the same time. My latest letter to the editor was published Sunday and I’m thrilled to say that today (Monday) there is a commentary by Congressman Charlie Gonzalez essentially agreeing with and expanding on what I said in my letter. The Congressman was apparently just as ticked about the editorial last week as I was and he details the negotiations over SCHIP that went on last year and shows how the Bush administration and its Republican enablers refused every attempt at compromise on this issue.